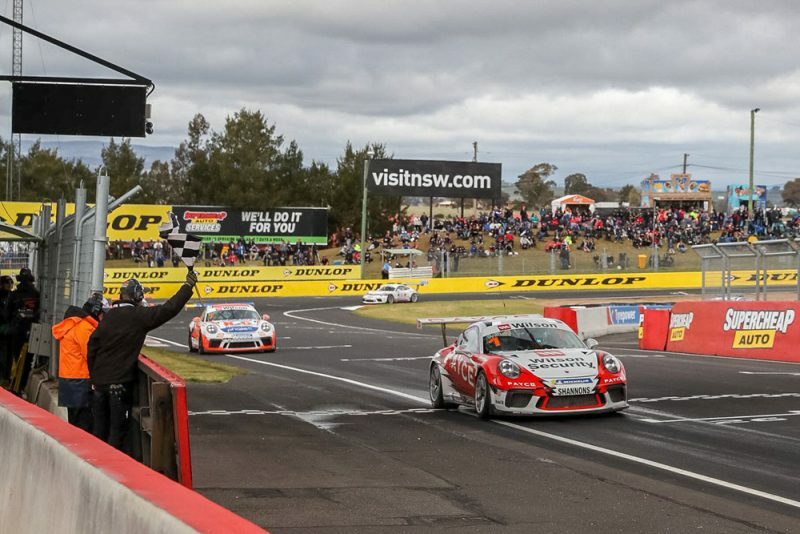 David Wall has won an action-packed opening Porsche Wilson Security Carrera Cup Australia race at Mount Panorama. 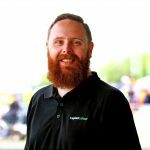 Wall inherited the lead after Michael Almond spun into retirement at The Cutting midway through the 16-lap race, having in turn inherited the lead following a clash between Dale Wood and James Moffat on the opening lap. A slow start from Moffat left the pole sitter on the defensive heading into Hell Corner, allowing Wood to take the racing line and the race lead. Further back, Peter Major and Dylan O’Keeffe made contact with the latter left pointing the wrong way as the field headed up Mountain Straight for the first time. There was drama later in the lap as Moffat and Wood made contact as they rounded the kink at the end of Conrod Straight. Thrown sideways, Moffat held the slide before secondary contact Wood’s car launched skyways, spinning into the gravel trap. The contact plucked the right front tyre from the rim forcing to drag the wounded car back to the lane for a replacement, rejoining proceedings without losing a lap courtesy of the Safety Car. Through the chaos Love took over at the head of affairs from team-mate Michael Almond. The restart was a less frenetic affair than the opening lap with Almond passed Love up the inside at The Cutting to take the lead. Evans was also an early mover, passing Cameron Hill on the first lap after the restart before harrying third placed Wall. A mistake from Love at Skyline saw him bounce through the gravel on Lap 6, shedding the chin strap underneath the front splitter. It left him easy fodder for Wall who quickly made the move to take second with Evans dispatching the former race leader for third when Love ran long at Turn 1. Wall then mounted a challenge on Almond, shadowing the Sonic entry until he eventually cracked. Running wide on entry to The Cutting, Almond lost the back end and clouted the barrier on Lap 9. Stationary just off the racing line, he was then tagged by Roger Lago as he rounded the corner moments later. The impact forced the Pro-Am points leader out of the race and drew the second Safety Car of the race. Wall led the field back to the restart, the 2017 champ feeling the need to defend against Evans as they rounded Griffins Bend. Having resisted Evans’ attack, Wall then edged out a small advantage which held to the flag to win from Evans and Love, with Stephen Grove claimed Pro-Am class honours. There was one final twist as Sam Shahin crashed out on the final lap, finding the wall on the entry to the Dipper. Moffat recovered to seventh after his opening lap contact, while O’Keeffe climbed back to ninth. The second Carrera Cup race of the weekend takes place on Saturday at 1350.